The party was organized by TheWindowsClub, MeraWindowa & PuneUserGroup at ICC Towers Hall in Pune. Along with giving an overviews of the developments of Windows 7, a interactive presentations of new Windows 7 features was also held. 5 copies of Windows 7 Ultimate were distributed as free fiveaways, along with T-Shirts, Puzzles, Tote bags, etc to those present. 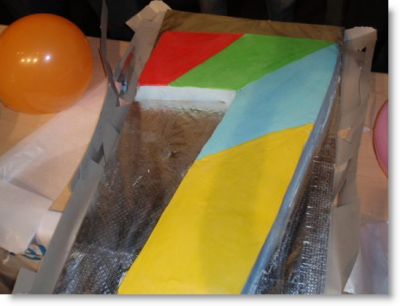 A 7 kg, 7-shaped cake bearing the 4 Windows colors was cut at the the hands of a 7th grader, Aditya. I cannot forget him! His passion, knowledge and enthusiasm about Windows 7 was simply amazing! Fortunately he was one of the lucky to get an answer correct and win a copy of Windows 7!